After two decades of collecting quotations both comical and profound, Gordon Jackson, a professor of communication studies at Whitworth, has published his sixth anthology of quotations. His book, released last month, is titled Sleep Faster, We Need the Pillows: 500 Logical Lapses, Paradoxes, and Other Mental Delights. This compilation, filled with intellectual witticisms, is intended to be both amusing and thought-provoking. “My hope is that readers will be amused, laughing out loud at an example or two, but also left thinking on why some of these quotations sound right and wrong at the same time,” says Jackson. Jackson says he has a passion for sayings and enjoyed compiling each of his anthologies; however, he admits that this newest book was the most fun to create. “Sleep Faster was plain playfulness all the way through,” he says. Jackson draws his material from his own private collection of interesting quotations, previously existing anthologies of quotations, and books that are related to the topic. Throughout the years, the number of quotations in a particular area accrues, and the idea for that specific anthology is born. Another method he uses for creating an anthology is to choose a topic and then find relevant quotations. 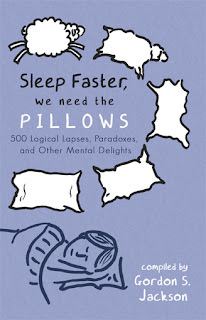 Sleep Faster, We Need the Pillows is currently available on Amazon and at the Whitworth bookstore, which can be reached at (509) 777-3277 or online at whitworth.thecampushub.com. Jackson, a native of South Africa, joined the Whitworth faculty in 1983 and has taught in journalism and worked in academic administration. His areas of specialization include journalism, media ethics and censorship. Jackson has released several prior anthologies, including The Weather is Here, Wish You Were Beautiful—Quotations for the Thoughtful Traveler (The Intrepid Traveler, 2009); Watchdogs, Blogs, and Wild Hogs—A Collection of Quotations on Media (New Media Ventures, Inc., 2006); Never Scratch a Tiger with a Short Stick -- And other Quotations for Leaders (NavPress, 2003); Quotes for the Journey, Wisdom for the Way (NavPress, 2000); and Outside Insights—Quotes for Contemporary South Africa (Human and Rousseau, 1997). Located in Spokane, Wash., Whitworth is a private liberal arts university affiliated with the Presbyterian Church (USA). The university, which has an enrollment of nearly 3,000 students, offers 60 undergraduate and graduate degree programs.